With the Alex Brands ZOOB S.T.E.M. 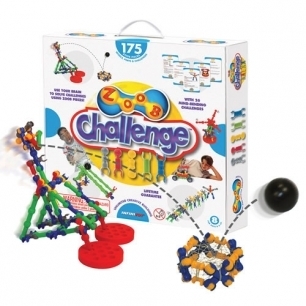 Challenge 0Z11175 ZOOB set, kids use ZOOB pieces to try to solve the 26 educational challenges. The challenges are all based on learning the STEM intitatives, an important focus in education. This play set can be used without the guided challenges as well, simply encouraging creativity and spatial awareness. Ages 8 and up. Sold by Gryphon House, Inc. Ships from Kaplan Early Learning Company.